I'll add: the book is set in an unspecified time and place, but it is very rural, and the general feel is maybe 1950s, with cars and trucks around, but not many telephones, and a more casual attitude toward fostering than we have today. This is a poignant little story, written in an unusual but effective style. It's heartwarming to watch a family forged out of nothing, and heartbreaking, too. I think the style lends itself very well to the audio format, and Ms. Henderson does a great job of reading it. The story is very simple, as befits a children's book. But it's told from the point of view of the adults (John and Marta), and this may not really be a children's book. I think it's really for the adults, and Creech might have done better to accept that. As it is, there are times when John and Marta are guilty of a naiveté that would work in a child, but rings false in an adult. These are things that a child reader might accept--but as I say, the story seems so much more for adults that it just rang wrong to me. And it is John and Marta who grow and change, not the boy, almost as if through his presence they become adults. All in all, it's a beautiful story and well-written, but I think it maybe misses the target a bit. With adult points of view and a distanced narrative style, I don't know if kids would enjoy it as much as adults. With just a few tweaks it would be a very strong adult book, and it's a shame that Creech didn't go with that. Well, this one is for people like me, I guess. People who like a simple, touching story that maybe is meant for kids. It's fine for kids over 8 or so, and I'd guess any could read it, but I don't know if they would, given the adult point of view (the boy is an enigma and seen only through their puzzled eyes). 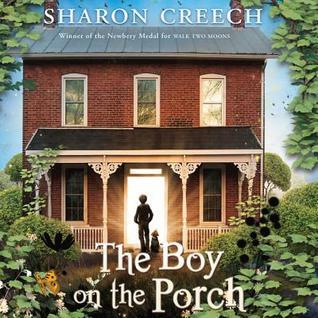 Full Disclosure: I checked The Boy on the Porch out of my library, and received nothing from the writer or publisher in exchange for my honest review. The opinions expressed are my own and those of no one else. I am disclosing this in accordance with the Federal Trade Commission's 16 CFR, Part 255: "Guides Concerning the Use of Endorsements and Testimonials in Advertising." I guess I'm with you on simple, touching stories. They are such a relief from the paranormal craze. Thanks for telling about this book. Even the title is simple and touching. Get a copy and enjoy it!